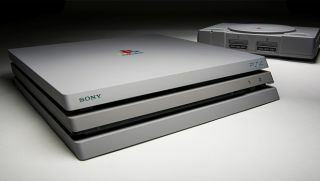 When it was celebrating the 20th anniversary of the PlayStation, Sony embraced its grey roots by creating a PlayStation 4 console with the color scheme of the 1994 PlayStation One. Now, a company called ColorWare is going down the same retro route, this time with the even newer PlayStation 4 Pro. Like Sony’s retro PS4, ColorWare is only producing a limited number of these custom PS4 Pros. However, we imagine ColorWare will produce significantly less than the 12,000-odd that Sony did. The hefty $899 (around £720/ AU$ 1170) price tag might slow down sales slightly given that it’s more than double the price of a standard PS4 Pro, but we’re still willing to bet they’ll sell out pretty quickly. The console is a North American model and will come with a 1TB hard drive, a matching dual-shock controller, all its original boxing, and a ColorWare Warranty of 12 months. If you missed out on Sony’s original 20th Anniversary console you can still pick them up on eBay, though you’d better be prepared to pay in the region of thousands rather than hundreds. If you’re that desperate for the retro color scheme it might actually be more financially sensible to opt for ColorWare’s unofficial paint job. They may be selling the North American model of the console but they ship all over the world.